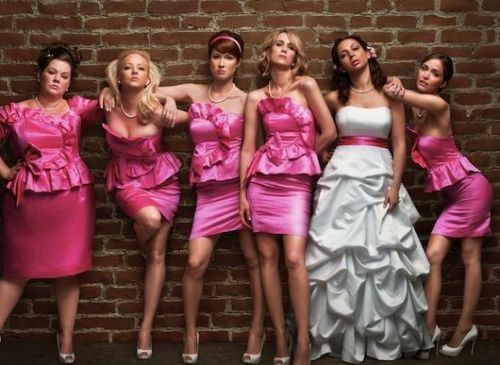 Pretty -- and funny -- in pink: Here come the Bridesmaids! The smash hit comedy Bridesmaids, starring the irrepressible and always-busy Kristen Wiig (Macgruber), arrived on Blu-ray and DVD on Sept. 20, 2011, from Universal Studios Home Entertainment. The film was issued in a handful of configurations on disc: as a Blu-ray/DVD Combo/Digital Copy Combo Pack in Blu-ray packaging for a list price of $39.98, as a DVD/Blu-ray/Digital Copy Combo Pack in DVD packaging for $39.98, and as a single DVD for $29.98. Concerning a group of gals prepping for their roles as you-know-whats for one of their friend’s impending weddings, the movie is produced by Judd Apatow (Knocked Up, The 40-Year Old Virgin), directed by Paul Feig (TV’s The Office) and co-stars the top-notch comedy ensemble of Maya Rudoph (Grown Ups), Rose Byrne (Get Him to the Greek), Melissa McCarthy (TV’s Mike and Molly), Wendi McLendon-Covey (TV’s Rules of Engagement), Ellie Kemper (Somewhere), Jon Hamm (Sucker Punch) and Chris O’Dowd (Pirate Radio). Released in theaters in the U.S. in mid-May, Bridesmaids has rung up more than $160 million at the domestic box office as of this writing (and that’s without any car chases or CGI!! ), making it one of the top five R-rated comedies of all time.